Like what it says above. Get it while you can at the Inkwell in ye old’e York. we only did 20 copies. Well, I’ve had enough of Supercollider for one day. I’m stuck on how to get my program to respond to midi data (I need James Harkins brain downloaded into mine). Even though my brain is frazzled for one day I thought I would post a little video of the cantus apparatus in action (the sound may be bad due to this being captured on a iPod as is the film work). cantus_apparatus from section_9 on Vimeo. Just got round to updating this webspace of mine. Go here and watch the ms stubnitz video. Then book me for your party. Then go here and check out all the albums Dr Tuffen and myself did then book us for your night. 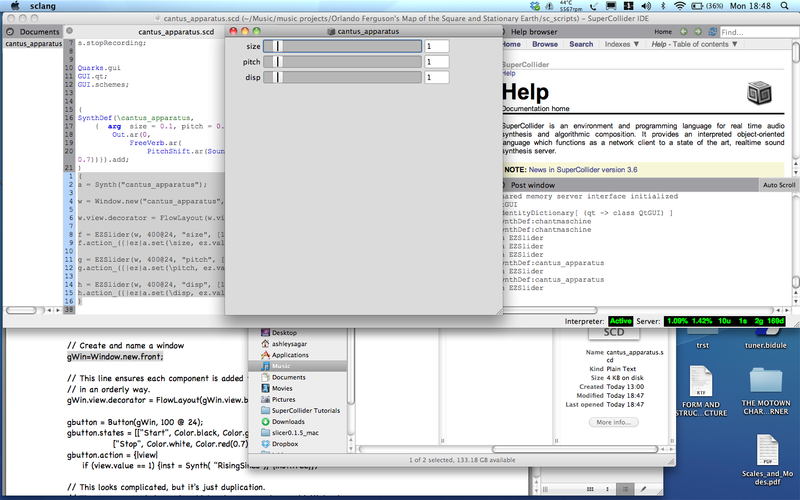 For ages I have been trying to find a project to make some software in SuperCollider. I have finally come up with one. The cantus_apparatus. The cantus_apparatus will be a small piece of software that will go a long way to minimising my current setup with the mighty Orlando Ferguson. Our next gig is on Nov 6th at Hogwash #10 here in Leeds. This gives me a nice deadline to have some working software to gig with. This is my first step into building software with with code so I’m sure it will be fraught with errors, hair loss and sleepless nights. I have no doubt that i will be living on the SCList and annoying many users with dumb questions. I will post audio, images and video as the project progresses. I made myself a new soundcloud page so that I can upload my audio explorations using the amazing Supercollider. Every now and then/day/week/hour/month I will upload something that I made in Supercollider. Hopefully my audio will get better with the more I post (hopefully). One of the bands I’m in, Gordy and Fleur, have just finally released an EP. Its a three track taster from our upcoming album. We are releasing it digitally on Bandcamp.